Many were the beautiful things in this Clemenza di Tito given in Gent. What struck me most was the beautiful ending of act one with the changes of moods and tempi. That’s Mozarts merit of course, but the opera was well conducted, sung and directed. Michael Hampe’s setting is traditional, with classical structures mixed with 18th/19th century costumes. 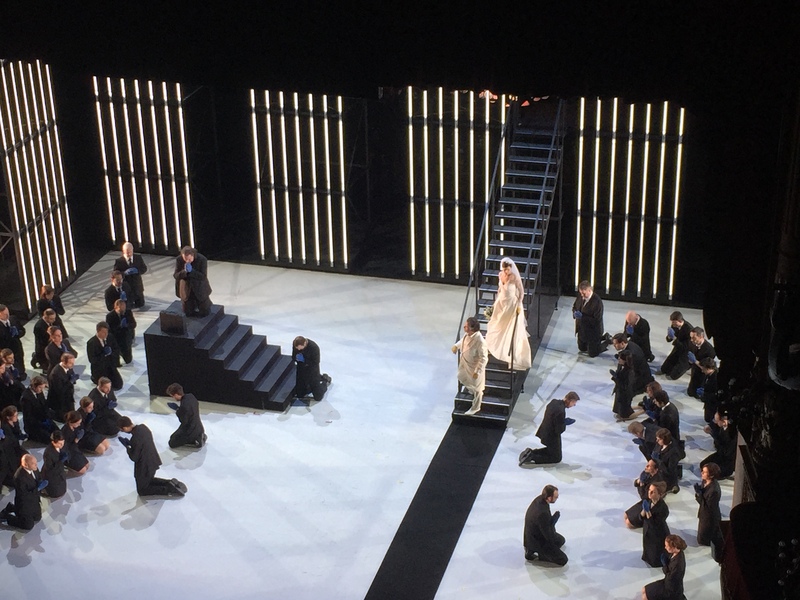 The movements on stage are very well directed, which is quite difficult for such an opera with a classical aria/recitativo structure and the chorus added drama during the key moments. Montanari conducts well what is more lyrical and shows sensitivity for the slower parts, but some pieces such as the ouverture or the March are too fast for my liking and are at the expense of details. The Sesto of Anna Goryachova is wonderful, her range equal in all registers, her coloratura exact and she is fully immersed in the character. Her recitativo accompagnato that opens the finale of act one (O dei che smania è questa) is very dramatic and shows her also an excellent actress, but the highlight for me was the aria Deh, per questo istante solo (Sesto’s confrontation with the emperor) where acting, singing and directing were just excellent. Lothar Odinius as Tito has a strong voice and sings delicately but it is not light enough to sing the runs accurately and he sinks in intonation in more than one occasion. Vitella is Agneta Eichenholz, her upper and lower register are not fully convincing and sometimes she pushes the notes from below but she sings acceptably well, her notes being satisfactorily steady to pass unharmed the trio (Vengo! Aspettate!) and the final aria. Cecilia Molinari is an impeccable Annio with an excellent phrasing. Very good also the Servilia of Anat Edri. 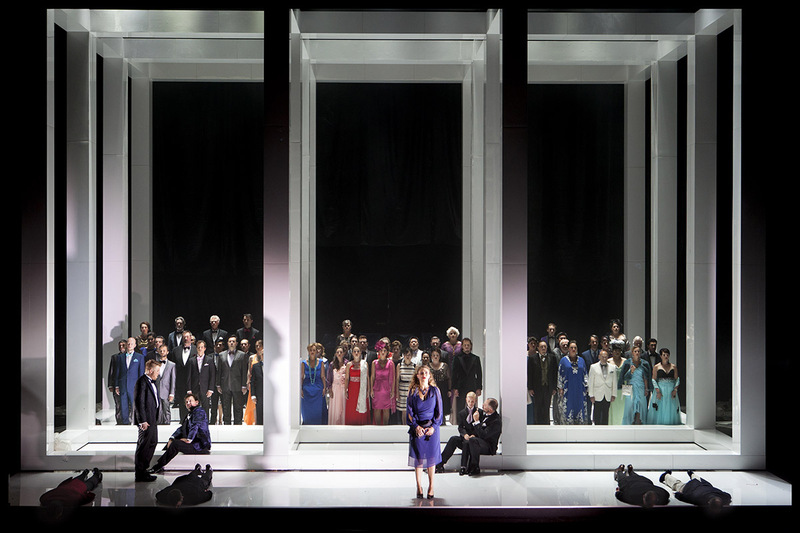 This wonderful production was completed by the Publio of Markus Suihkonen and the chorus of the Flemish Opera. How many Zauberflöte can one watch without start to be bored? I mean…the priggish Sarastro is unbearable, the writing of the libretto awful with much racism and sexism, the horrible duet for the two priests etc etc etc etc… So well done David Hermann in giving the story a completely new interpretation. 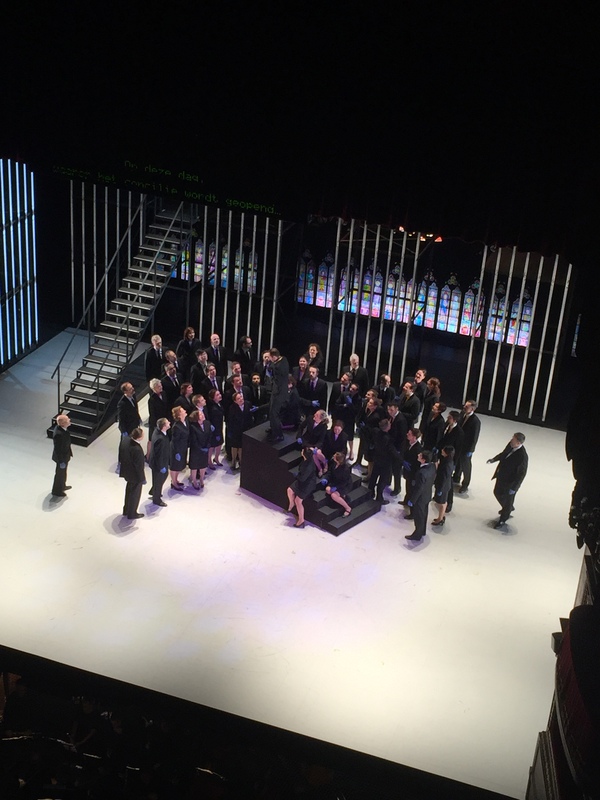 This was not without a proper tweak at the libretto, but OK….the horrible duet of the priests stayed horrible, but it was the first Zauberflöte (after my first and the Kosky one), where I did not leave somewhere before said duet. Except for the opening scene, which looks a bit post-apocalyptic and where the three ladies are constantly in contact with each other, moving like a menacing blob, the sets bring us to what looks like rural America, a small house in the prairie (I guess where people are held hostage and tortured). Sarastro is the ruthless, misogynistic leader who is into taxidermy, abusive of Pamina, and heartlessly kills the Queen and the ladies at the end. Papagena is a handicapped hostage in wheelchair and Papageno is an ape-like creature that crutches when frightened and hisses like a cat when he is scared. He brings hunted birds to the three ladies at the beginning. The ladies don’t offer a flute and glockenspiel to Tamino and Papageno, but a revolver and gas bombs, the latter of which Papageno uses to knock out Monostatos. The opera ends with Sarastro smoking a cigar on his patio (after killing the Queen and the ladies); Pamina and Tamino come back and shoot him dead, presumably ending the cycle of horror. It’s one of these staging which reading would have made me think it’s a bad Regietheater. Regietheater it is, but a refreshing interpretation well thought through. The sets are beautifully designed, alternate at almost every scene and the changes are swift. The orchestra gave a beautiful performance, playing clear and transparently with Jan Schweiger at its head, who made me fear the worst with the too solemnly played opening bars, but who excellently conducted with vibrant dynamism. Tarver has a hard time to find delicacy in the higher notes, Miss Sabirova was not completely fluid with a barely touched f in O zittre nicht, Josef Wagner also a bit hefty as Papageno, but overall the cast was very good. Lore Binon interpreted a beautifully sung, pure and clear-voiced Pamina. I’d love to hear more of her. Sarastro doesn’t seem to have secrets for Ante Jerkunica, who displays an attractive and warm timbre, especially in the deepest register, the best Sarastro I’ve ever heard. I don’t feel this Idomeneo had any particular faults so maybe I just was in a particularly scrupulous mood. I found Roberto Saccà throaty, Renata Pokupic gasping for air every couple of seconds with not even a hint of a legato, Serena Farmocchia missing the vocal gravity for Elettra, and the direction at times a bit silly. Furthermore the opera had quite lengthy recitatives and I couldn’t understand almost anything. Singers without a proper pronunciation are, in my eyes, not complete, even the phrasing comes across a very approximate when words are not taken care of. On the other hand I appreciated the direction’s narrative clarity, the diction of Roberto Saccà (the only one), Ana Quintans sweet timbre and beautiful singing. I also enjoyed the swift and crisp sound of the orchestra, prepared by Paul McCreesh and on this evening directed by Benjamin Bayl. Everything considered a good performance though not fully convincing. For years I tried to listen to Wagner. But it’s just not my thing. And the 3-4 times I went to see it life (Tristan, Götterdämmerung, Holländer and one more I think, and only because it was part of my subscription) it turned out to be an expensive nap and a repetition of steps which followed the same sad pattern: 1-Enthusiastically think about an evening at the opera, 2-Listen carefully forcing myself to scratch together a bit of curiosity, 3-Feel the tiredness come up after 5-10 minutes, 4-being woken by thunderous applause and leaving the opera at the first interval. Big was my surprise when I assisted at Tannhäuser at the Flemish Opera in Ghent a few days ago. The ouverture is melodious, there are arias, duets, ensembles, instead of endless non-stop music, and not too bad ones at that. Of course for somebody who hungers for belcanto, everything seemed different, main thing being that singers seem to scream. But at least this opera made me want to stay another act rather than running off like a scalded cat. I am really not the right person to talk about Wagnerian voices. But Tannhäuser sounds like a murderous role, a huge range. And I admired Andreas Schager who was up to task. Liene Kinca as Elisabeth had a beautiful timbre and never forced her voice. It rather sounded as if Venus (Ausrine Stundyte) and Walther von der Vogelweide (Adam Smith) had slight difficulties when notes rose too high. But I liked Daniel Schmutzhard and Ante Jerkunica in their respective roles as Wolfram von Eschenbach and Hermann. Calixto Bieto kept the things in black and white, tree tops hanging from the ceiling on black background in the first act, clean and minimal white lines in the second act. I don’t go into the interpretation as already reading the libretto awakened a mix of hilarity and ridiculousness. But the orchestra and chorus played and sang well. The Opera van Vlaanderen staged La Juive by Fromental Haléy. This grand opera follows the fortune of other grand opera such as Guillaume Tell and Les Huguenots. One enters with mixed feeling into the opera house seeing heavily armed police at the entrance doors. In 1830 Europe other countries were equally careful, albeit for different reasons, such as Italy, where staging a cardinal was unthinkable. It is therefore surprising, how easy it was, at the first staging of the opera (and how marginally the local press touched the socio-political topic in a Paris, which went through all the horrors of religious wars and suppression), how easy it was, I was saying, to stage not only a whole council, but a plot which involves conflicting religions (present day problems then and now), horrible death sentences, and religious intolerance (from both sides). We certainly didn’t have this problem with the staging of the Opera van Vlaanderen. 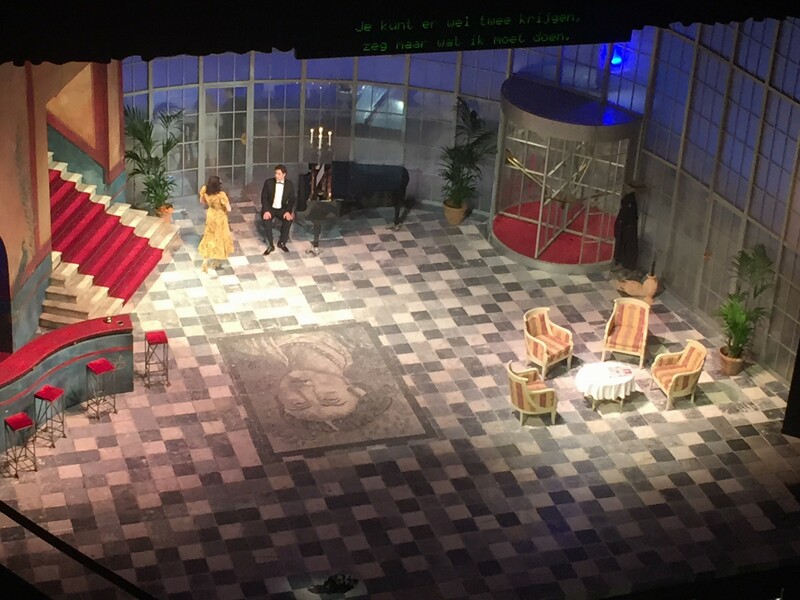 The scene is almost empty with just a few stairs in the first act, a table in the second act (to celebrate Jewish Passover) and a bed in the third. The choreography of the singers is conventionally silly: for eg while the chorus sings from the stalls at the end of act 1, the soloists just “act desperately” on a totally empty stage. Eudoxie is a hyperactive, alcoholic woman whom (in her first entry when she visits Eleazar to buy the “joyau magnifique”) we see waiving a bottle of champagne in one hand and a gun in the other. 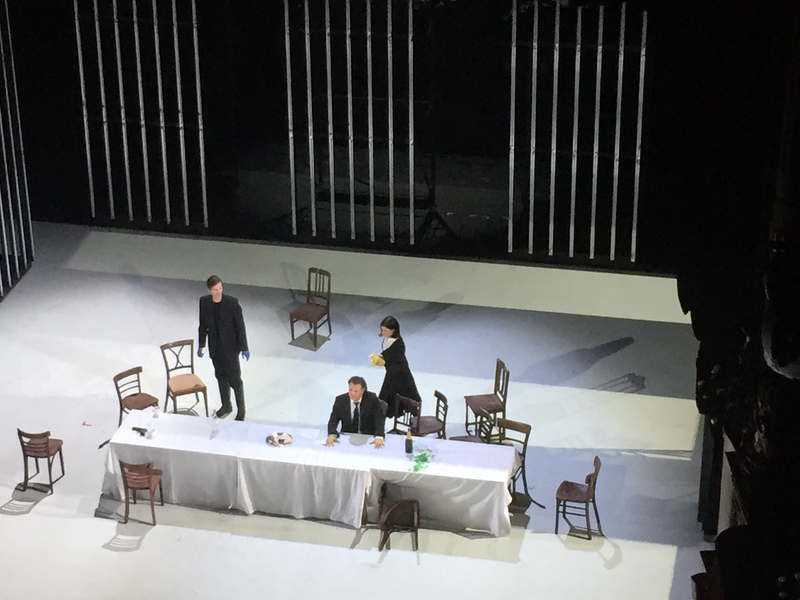 In the anathema of act three, cardinal Brogni tears the bed apart and throws the pillows to the Christians around them…. At the anathema!… A Cardinal! !… Throwing pillows!! !… One feels almost like praising the idea of the coloured hands: Christians have blue hands, Jews have yellow hands, sometimes they hide their hands in the pockets in order to hide their faith and the symbol is used throughout the opera, also in prison when Eudoxie comes to beg for Leopold’s life. Eudoxie and Rachel wash the colour off their hands and sing the stretta with “clean” hands to show that finally love and friendship are more important regardless which god you pray to. Not too bad as symbol, maybe a bit infantile, but bon…I’ve seen worse. But then the director messes up everything by making the two women whirl in circles, laughing like girls and roll on the stage like on a blooming meadow. While Leopold is being sentenced to death!… Circling like girls! !… Laughing!!! But these are just examples of an overall very disappointing and superficial interpretation. One word on the lights: it’s hard to enjoy the evening if one is constantly forced to move from the plot of the opera to the real world. Since the action often moves to the stalls, these were regularly lit with bright light. How disillusioning is it to see people pulling down their skirts suddenly realizing they are observed, to see people yawning, leaning into bored positions. Then again on stage at the end of act 4 some of the main singers were so badly lit, one could hardly see who was singing. And then some of the light just went off similarly when pushing a light switch at home. Musically things went better. Roberto Saccà is a credible Eleazar, still able to move with his interpretation and he manages the range with ease and interprets the declamation passages well. Jean-Pierre Furlan had a less appealing timbre and a slightly stretched high voice but his interpretation was very moving. Asmik Grigorian as Rachel has a lovely voice especially in the middle register. Sometimes her top notes sound stretched also, especially in the finale of act one and the musically marvelous duet with Léopold in Act II. Overall the singing was convincing in a murderous role which was created by nobody less than Cornélie Falcon (the first Valentine in Les Huguenots, just to name one). Gal James’ had a more cautious approach which made her low notes less vibrant and rich, but both rendered a touching Rachel.